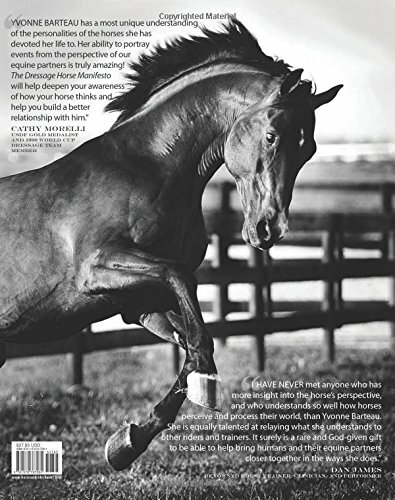 Grand Prix dressage rider and performer Yvonne Barteau has trained her share of horses over the years from off-track racing Thoroughbreds, to Arabians, to Friesians, to Warmbloods and she asserts that everything that needs to be known about effectively training a horse is already known…by any horse. Each horse, says Barteau, will know and respect the person who figures out how to train him, if that person is fair. The best trainers are not only horse whisperers, they are listeners. And readers. They listen to what the horse has to say. They can read horse body language and behaviour patterns and they stay calm under pressure. Barteau believes that every dressage rider can learn to listen and read, and so experience greater success and partnership with his or her horse. 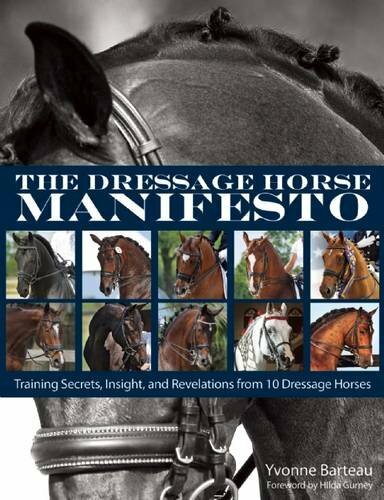 In this book Barteau has used her knowledge and decades of experience and success in and out of the dressage ring to help put to paper what 10 different dressage horses would say to you about horse training if they could. 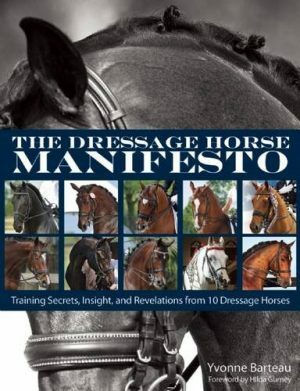 Through the dressage horse s mouth, from his point of view, readers learn: how simple things really are and how complicated we make them; the value of routine, consequence, and peace; the importance of leadership, fairness, and trust; the need for your sense of responsibility to match your ambition; plus, what kinds of rewards really work and what frightens, annoys, or causes horses to disregard us altogether. Yvonne Barteau has trained over ten horses to the Grand Prix Level and has won numerous USDF Horse of the Year titles. She is a sought after instructor and clinician as well as a public speaker on equine personalities and temperaments. Yvonne and husband Kim have also worked in the equine entertainment world for over twenty years with everything from liberty work to bridleless Grand Prix exhibitions. They have appeared on the Today show, at Madison Square Gardens, Equine Affaire and Equitana as well as performing with the horses at the Arabian Nights Dinner Theatre in Florida.